The cost of moving house for many families is simply not an option that they can afford and therefore rather than move they choose to improve. One of the great ways in which they can improve their homes and gain more space is through basement conversion using waterproofing membranes. This is the most current and most advanced waterproofing system available on the market currently and because it is so easy to implement it seems to be the popular choice for many basement conversion contractors and Twistfix supply a number of these. Basement conversions can take on any form from bedrooms, lounges, play rooms to the slightly more adventurous of full family entertainment rooms with cinemas and even to include swimming pools. In the majority of cases there is no need to even apply for planning permission although there are certain exceptions to this including listed buildings. Waterproofing membranes or damp proofing membranes as they are sometimes called within the basement conversion industry provide an air gap between the membrane and the wall which allows for water to pass behind it. The membrane is then mechanically fixed to the original sound wall and then overlaid with batterns or other framing systems to which then plasterboard can be fixed ready for basement finishing. Waterproofing membranes are chosen specifically dependent on the finish which is required and also the anticipated flow rate. 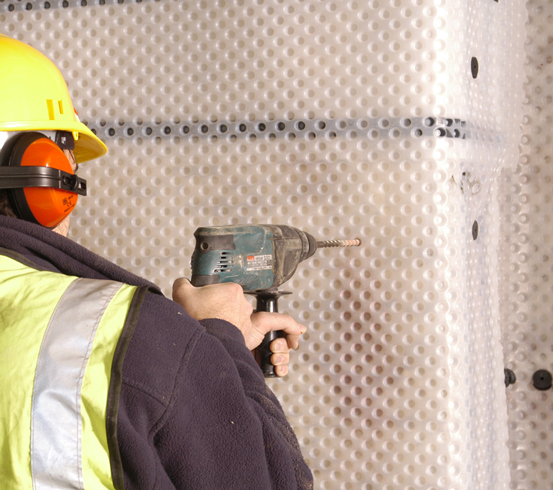 When the British Standard for the waterproofing of structures below ground, BS 8102:2009 came in then the use of cavity drain membranes has become the most popular form of structural waterproofing within the UK and are able to deal with a number of aggressive ground water conditions if specified properly. When the waterproofing membrane is secured using membrane plugs and waterproof plug seals then there is no chance, if fitted correctly that the basement conversion will flood or have any damp problems. 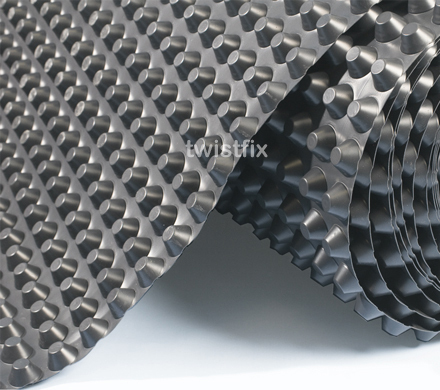 Twistfix will supply the basement waterproofing supplies for small or large scale projects. If you require help and guidance in selecting which membrane will be best suitable for your project then call our expert sales team who have had many years’ experience within the construction and building industry. For more information then please contact us today on 0845 1236007 or email sales@twistfix.co.uk.